An “Escale” is a place where one relaxes and resource between two stages.. We decided to build our house from wood as we wanted to reflect the flora and fauna and the numerous activities available in the nearby town of Mont Tremblant. We have focused on open spaces and multipurpose rooms. We want your stay focused on relaxation, sport and discovery, and we are happy to share with you the warmth and charm of our house. We designed it intimate and comfortable, suitable for leisure and relaxation: sauna, spa, fitness room, swimming pool and cinema space. The themes of our rooms reflect our past in different regions of France and offer alone invitations to travel experiences. Our vision is to open up to the outside world from home. 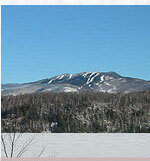 Enjoy the vibrant and beautiful side of this small town of Mont-Tremblant. For a relaxing or sporting holiday, come and relax away from the stress of the city. We will be happy to receive you in a warm atmosphere and help you learn more about our beautiful Laurentian region north of Montreal.